Bookburners: “Eating Words” by Brian Francis Slattery. Season four, episode 9. In this second to last episode of the season, an all-out attack is launched on the secret society beneath the Vatican. 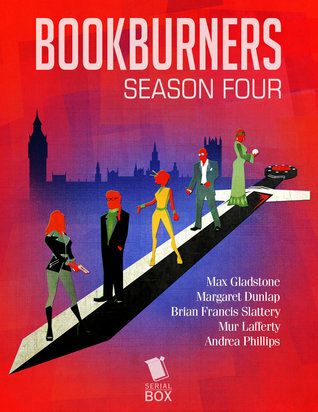 Usual reminder for potential new readers: Bookburners is an urban fantasy serial story, and these reviews will contain spoilers for previous seasons and episodes. The former Team Three is nervous about going back to the Vatican, for obvious reasons. But they also know that the Oracle said that the Vatican would be the site of the next attack, and Team Three has never backed away from trouble. So they head to Rome and get prepared… Not that they have much time to prepare. The demon Quelzhemox is already on his way at the behest of the Swedes, and he isn’t alone. This was a very bloody episode. In fact, it gave me flashbacks to season one, when demons previously tried to attack the Vatican. Team Three defeated them then, and that’s given them confidence. Only… the demons have learned a thing or two, and they now know to bring overwhelming force. In other news, I cruelly misjudged Ashanti. She does care about Grace after all! That scene (you’ll know it when you read it) made me very happy, even if there’s no sign of a cure for Grace. I’m starting to wonder if there will be a cure, or if Grace’s storyline is going to be more about her accustoming herself to her mortality. I have thoughts on this, but I’ll save them for my review of the season finale. Oh, also relating to Grace, she had Sal ended this episode with this tension. Honestly, it just seems like drama for the sake of drama to me. I could have done without it. Menchú has officially left the Church. I mean, he pretty much had already, but in this episode, he straight up tells Cardinal Fox, “I’m leaving.” That chapter of his life is closed, and he’s starting to wonder where he’ll take his future. I wonder too, but it’s all a bit moot if the world’s going to end, so Team Three better get on that. Speaking of the world ending, this episode continues to develop the idea of learning to live naturally with magic. Maybe managing it, like a river is. Essentially, acknowledge that increased magic levels are here to stay and then work within that to find a new style of life for humanity. I think the idea has a lot of promise, but it does depend on the world still existing and magic levels not getting too high. From what Hannah said last season, the situation looks a lot more dire than that. I’ll see you next week for my review of the season finale!